Our trainers are committed to teaching dog owners how to communicate with their dogs. Our dog trainers have spent years molding and perfecting a technique that relies on positive reinforcement to increase comprehension. Shoot us an email or give us a call today to learn more about how we can help you and your dog. has spent years perfecting our dog training system. The Dog Trainer sets up a communication system with your dog through markers. The learning phase is positive reinforcement. As the dog become fluent in the communication system, The Dog Trainer then introduces other quadrants of learning for the dog to be able to work through distraction and learn to control his/her impulses. The product is a happy eager and obedient dog! Take a tour of our state of the art facility located in the heart of Chicago’s West Town Area, with our Google 306º tour. Not able to come to us? Don’t worry, we will come to you. Please contact us for more information on in home lessons. Ari has spent the better part of the past 25 years training and studying from the greatest dog trainers in the world. His obsession began while attending the University of Kansas with a German Short Hair Pointer/Lab mix named Bo, and flourished from there. Since then Ari has dedicated himself to formulating a system that allows him to successfully teach dogs and humans how to communicate. He also rehabilitates dogs for various rescues. Zica is The 2014 French Ring I Grand Champion, The 2015 French Ring II Vice Champion and has completed her French Ring III. From the age of 7 weeks, Zica has been Ari’s star pupil and often helps in the training of other dogs. Aliya has currently worked in the pet training field for 7 years and was certified through the Certification Council for Professional Dog Trainers-Knowledge Assessed (CPDT-KA). The training facilities she has worked with specialize in pet obedience, intensive behavioral modification, and the fostering/training of rescue dogs. This experience has given her the knowledge of how to implement effective training solutions through a proven communication method. She takes a balanced approach to training with a focus on positive reinforcement that results in freedom for owner’s and their pet. Aliya values teaching people and their pets the skills that create an enjoyable and healthy relationship. Aliya competes with her dogs Mischa and Ecko in AKC Obedience and CPE Agility. 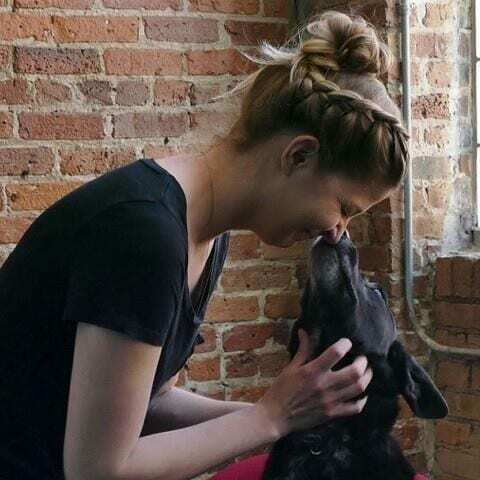 You can also find her dogs manipulating clients into giving them treats by fetching them drinks and performing tricks as the mascots of Downtown Dogs Chicago. Our dog was having behavior issues – specifically with guarding. We searched high and low for someone we felt we could trust to help us and our dog, and talked to several trainers before choosing Downtown Dogs. Ari was upfront, practical and very patient with us. The best thing was that he was so good with our dog! It was very clear that Zeus loved him when we went to pick him up after his board and train. Ari was and has remained accessible even a year later. We followed the training instructions with Zeus and we enjoy him so much more! The other great thing is that he has great recall now and we love being able to have him outside enjoying our big yard (there are no fences where we live). We love watching him run full speed and playing with him outside. He also drops the things he would have aggressively guarded once upon a time. We love him and enjoy him so much! We are so grateful to Ari and Downtown Dogs and wouldn’t hesitate to recommend him. Ari is truly fantastic with dogs (and stressed owners)! Hands down, he’s the best. I brought my golden retriever puppy to Downtown Dogs for a three week board and train and what a huge difference it has made! Ari did such a fantastic job training both my dog River and me. The biggest difference is that now River pays attention and listens to commands. We were having problems with leash pulling on walks and jumping up on counters, beds, and furniture but have all of that under control now after his stay at Downtown Dogs. The e-collar that he was given is an easy way to correct anything River is doing wrong and incredibly effective. I have also boarded River here while on vacation and definitely will continue to do so. Ari has a gift with training dogs, he pays attention to your needs, I know my dog is always in good hands while there, and I highly recommend Downtown Dogs! Hands down Ari is the best trainer I have ever encountered! He has incredible passion and knowledge and his training methods are reliable and most of all they really work!! Our dog, Krash developed issues with encountering other dogs to the point I didn’t even want to walk him or take him to the dog park anymore. I had him stay with Ari at Downtown Dogs Chicago for several weeks. The change in Krash was apparent immediately and Ari gave us tools and skills we never would have thought of. People come over and can’t believe how well behaved he is and walks are now enjoyable again. Ari is amazingly responsive to calls, texts & emails and he truly cares about you having a well trained dog. His facility is impressive and very clean. Ari taught us so much about our dog and how to interact with him. Even if your dog just needs some follow up training or to advance what he/she knows this is the right trainer. We were so happy that we signed up for group class with Krash and we continue to learn and most of all Krash LOVES it! Highly recommend Downtown Dogs Chicago. Ari and his team at Downtown Dogs are a godsend. I have grown up with dogs all my life, and used quite a few trainers around the Chicagoland. While effective, I never felt that the training/boarding/etc was a strong positive experience for my dogs until Ari. I came to meet Ari when I adopted my dog Murphy. Murphy is an Irish Wolfhound Mix, so a big dog with lots of energy and a strong personality. Murphy had actually been given up by three separate families before I adopted him from Ari and his team. It is shocking to think that other families would have passed on this dog, after the remarkable transformation he made under Ari’s care. Murphy is beyond the best dog I have ever had – zero behavioral issues, and we rarely leave the house with a leash because his heel command and other manners are so impeccable. Ari worked with Murphy on an e-collar, which I had never used in the past. 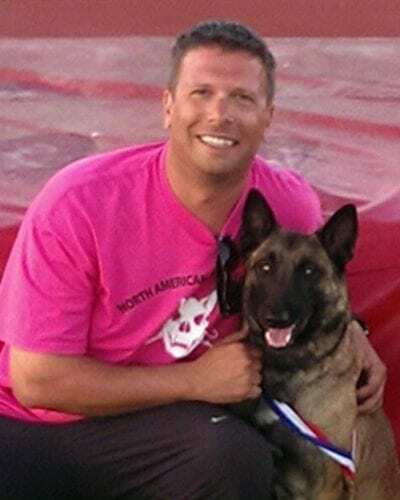 While hesitant at first, I will never train a dog without one moving forward, as it is the most humane and effective correction I have ever worked with. I can take Murphy through a crowded park, or a busy street in the city, and I have full confidence that I can keep Murphy inline should a distraction present itself without jerking a leash, raising my voice, or acting in any way that attracts attention from other people. Ari continues to be my go-to mentor for all things dog. Recently, Murphy was caught in a pretty bad dog attack at a daycare facility resulting in multiple bite wounds which required surgery to be repaired. Ari was immediately accessible helping me to make sure I received the best care for Murphy though out this ordeal. Due to work travels, Ari even cared for Murphy at his facility while Murphy was still on bed rest with wound drains, stitches, a giant cone head, and daily medication. Even though I hated having to leave him, it was such a blessing to know that Murphy would be cared for and treated with the utmost attention at Ari’s facility. I will never adopt another dog without Ari’s guidance and review. All of my dogs will have the benefit of Ari as a trainer and second home when I travel. I cannot speak more highly of his knowledge and skill in the dog world. It is miraculous to see how effective his training can be, and the absolute adoration my Murphy has for him and his team. Ari, thank you for all that you do for Murphy and I! We feel so blessed to have you in our life!